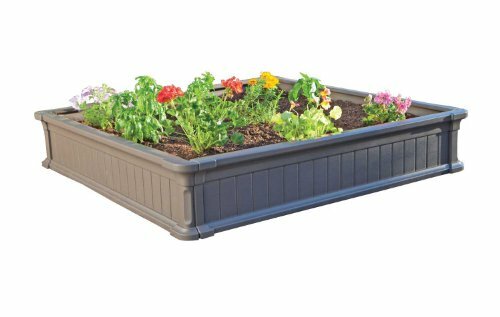 Lifetime Raised Garden Kit - The 4' x 4' Lifetime Raised Garden Bed features 9" high walls and inter-locking assembly. This model is 12 pieces, making (3) 4' x 4' boxes and comes in brown. The 4' x 4' Raised Garden Bed from Lifetime Products gives you the perfect garden setup in in less than one hour. It is constructed of uv-protected high-density polyethyene (HDPE) with a simulated wood design. It is low maintenance, weather resistant, and will not rot, crack, or peel. The walls are 9 inches high, but two beds can be stacked together to create 18 inch walls to accommodate deep rooted plants. With its easy do-it-yourself assembly and low maintenance features, gardening has never been this easy.